Imagine feeling the wind in your hands. It’s a beautiful day at the park, school, or beach; the wind is blowing; and there is nothing but you, your children, and a kite to make magic. You set up the kite, unwind the string, and take off running. The kite just drags on the ground; nothing happens. Then you try again, but this time your child throws the kite towards the sky as you run and suddenly, “whoosh!” Your kite is high; you all are squealing with joy; and you feel as free as the kite as you teach your children how to hold the string, feel the wind in their hands, run with it to keep it afloat, and maybe even get it to do a loop or two. There are a myriad of kite shapes and sizes, but one that makes you smile as you look at it is the right one for your family. Homemade or store bought, a single string kite is easier to keep up in the air – (Keep moving with it to feel the wind! Do not just tie it to your beach umbrella!) – but a two stringer allows you to do super fun kite tricks. 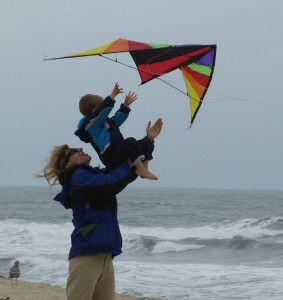 I gave my three-year old the string to hold, but I was also holding it, closer to the kite so while I had more control, he was involved, feeling the breeze and running with me in every direction to catch more wind. My five year old threw the kite in the air, ran after it when it fell, and ran circles around us in excitement. Let an older child fly his or her own kite and run alongside. Exhilarating exercise? Check. Feeling the wind in your hands? Check. Unforgettable family time? Priceless. Pick a charity and press “start”. As you walk, run or bike, the app tracks your distance and you (and your family) can play your way into philanthropy. A double good workout! By Guest Exerciser and Mom Sara P.
On that cold cold wet day. …All we could do was to sit sit sit sit. Whether it’s because dinner is on the stove, a younger sibling is napping, or the weather is bad, sometimes you’re just stuck inside. But being stuck indoors doesn’t mean you need to sit on the couch in front of the TV. Wonder Forge produces a line of family games, based on Dr. Seuss books, that can get you and your kids moving. And they’ll be learning in the process! 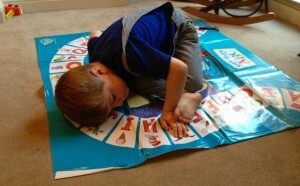 My 4-year-old is a big Dr. Seuss fan, so I picked up Dr. Seuss’s Super Stretchy ABC Game (http://www.wonderforge. 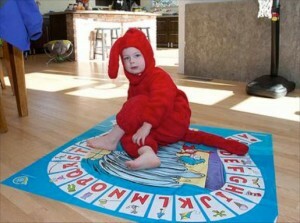 com/products/dr-seuss/super-stretchy-abc-game/). The game is like Twister for preschoolers (it’s marketed for ages 3 and up). The game includes a large alphabet mat, the “Cyclone” spinner, and alphabet chips. To play: the chips are loaded into the cyclone, and the “caller” spins the cyclone to distribute five chips: one for each hand, each foot, and an ear. The “Twister” then has to meet the challenge. For each hand, foot, or ear the Twister can place correctly, he/she gets to keep that alphabet chip. The winner is the player with the most chips at the end of the game. My son loves this game. He loves getting to be the Twister, but he also loves watching Mom and Dad twist and bend to try to meet the challenge as well. And whether he’s calling or twisting, he’s also learning his letters and the sounds they make. Win-Win! 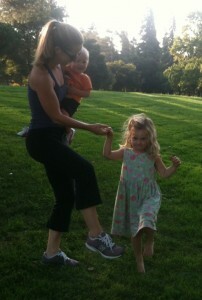 Most 2 or 3 year olds will walk silly for fun, and we parents watch in delight at the natural movement of our children. And then we forget. We hurry and rush our kids to walk to school or the the store or even off to bed. However if we pause, we’ll notice even teens have silly walks in them if you give them space (and act like you are not watching). Can you do crazy long-legged silly walks? Or super slow or fast marching? Can you hop on one foot towards the store? How about the other foot? Now jump on both. What about sideways? Try galloping frontwards and backwards. What about 3-legged walks, tying your leg to your child’s? Granted you won’t get very far fast, but if you do it while walking to the mailbox, you’ll have a very memorable and healthy time. Compete to see who can make up as many ways to travel as possible, then see who can do it for the longest. The person who came up with the move might not be able to do it for very long. Remember bear/dinosaur walks, penguin waddles and kangaroo jumps? What about crab walks, walking on your hands and feet while facing up? Play follow the leader letting your child start first. Can you walk on your hips, inching them forward as you move around your house? Who is fastest? Even break dancing, like moon-walking, can get you from one place to another so it counts. Can you turn your land of the silly walks into a slippery land? Or upside-down and walk in a handstand down the hall? Have a smartphone? Want to play Scrabble® and exercise with family and/or friends all at once? Try the excellent game of Seek ’n Spell (99 cents) that is essentially running Scrabble. The Seek ’n Spell App works with your phone’s GPS to fill the space you are in with virtual letter tiles that you run to collect. Rather than sitting in one place with the letter pile in front of you, you get to run around the field to where the letter is on your screen. Once you are in the letter’s location, you can use it to form a word. Check out their website- www.seeknspell.com and watch the video, or click on “How to Play” for a great description. How to play with your family? 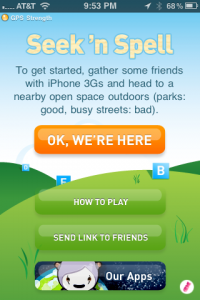 Go to an open field or park that has good phone reception. With more than one phone, split up into parents versus kids, one parent per group of children, or however seems best. See who can spell a word the fastest, a word with the highest score or both at once. You can set how long you want the game to last (say 10 minutes), and you can add multiple players. If you have one phone for everyone, figure out where the next letter is on the map and race each other to get there first. You can also take turns playing and compete to spell words with the highest score. One obvious warning: the game is such fun you have to remember to watch where you are running instead of looking at your phone!